The Spring/Summer special edition features Portfolios and Interviews from the 2018 Windland Smith Rice Awards by the Grand Prize winner: Nelis Wolmarans and the Youth Photographer of the Year: Isaac Spotts. 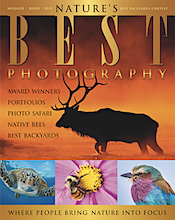 This issue showcases Winners from the Best Backyards and Panasonic Pictures Photo Contests. You will also enjoy a story from Ripple Effect Images about a community with a plan to reshape the future of girls while rebuilding the forests in Piplantri, India; Book Reviews; photos by the 2018 Photo Safari participants; a feature on pro photographer Cheryl Opperman; Part 5 of the Mindful Lens by Charles Freligh, and photographing and conserving our Native Bees by Clay Bolt.